Isn’t Mitt Romney a Member of the 47 Percent? Romney should not be so dismissive of the tax-avoiding class. After all, he's one of them. That, Romney suggests, makes them non-entities in his political calculus. “My job is is not to worry about those people,” says Romney, who predicts all the “dependent” voters will back Barack Obama this year. “I’ll never convince them they should take personal responsibility and care for their lives. But Romney should not be so dismissive of the tax-avoiding class. After all, he’s one of them. The nonpartisan Tax Policy Center says roughly 46 percent of Americans paid no income tax for the last year where numbers are available, 2011. Slightly less than half of those who do not pay take advantage of tax breaks designed to ease the burden on elderly Americans who live on fixed incomes. Roughly a third of them do not pay because they are beneficiaries of tax credits designed to help the working poor and children to get by. In other words, the Americans who do not pay taxes are, for the most part either low-income workers or retired low- or middle-income workers. They are not dodging tax responsibilities. They are filing forms and taking exemptions that were designed to relieve or eliminate tax burdens for those who are least able to pay. The Tax Policy Center offers the example of a working couple making minimum wages who have two children and earn under $26,400 a year. Using standard deductions and specific exemptions designed for families in their circumstance, they can file a form that has a zero in the amount due column. Tens of millions of American households—many of them our hardest-working citizens—find themselves in this category. Remember that, according to the Census Bureau, 46.2 million Americans lived in poverty in 2011. Mitt Romney is not a member of this class of Americans. As a quarter-billionaire, he is part of a multi-generational elite—the most privileged 1 percent of the 1 percent—that has never ever had to worry about making ends meet at the end of the month. But Mitt Romney has something in common with the working poor. Like them, he benefits from federal programs that are designed to allow some Americans to avoid paying some or all of the taxes that would otherwise be due from them. Roughly 13 percent of high-income Americans use itemized deductions—mortgage interest, health payments, or charitable contributions, education tax credits, or tax-exempt interest—to zero out their taxes. Mitt Romney has not released the tax returns that his dad said a candidate for the presidency owes the American people—forms for the twelve years before their candidacy. 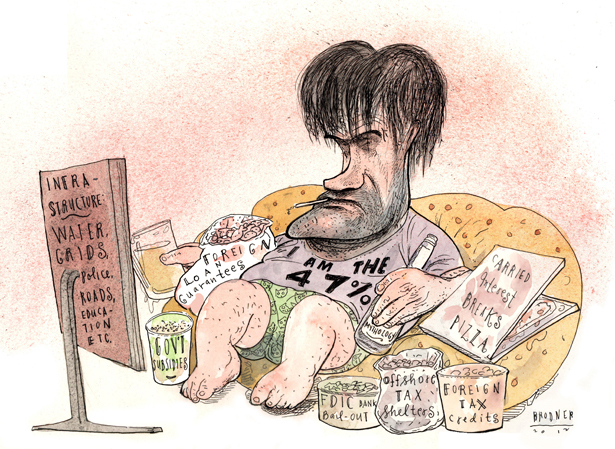 So we do not know if he is an actual member of the 47 percent. All indications, from Romney and his campaign, are that he has taken full advantage of: tax exemptions, tax credits, tax havens and tax loopholes. What sort of loopholes? We get an indication from documents filed by the firm that continued to stream money into Romney’s personal accounts long after he quit as a partner. That’s how someone who makes tens of millions of dollars says he pays around 13 percent of his annual income into the US Treasury, as opposed to the top marginal tax rate of 35 percent. For 2011, he estimated that he would pay $3.2 million on income of $21 million. If Mitt Romney had paid at the 35 percent rate that he is supposed to be paying at, the check he wrote would have been for $7.4 million. So he avoided paying $4.2 million in taxes. At the very least, it would seem that Mitt Romney has earned honorary membership in the 47 percent. For the latest on the Romney’s revealing video leak, see Greg Mitchell’s live blog.